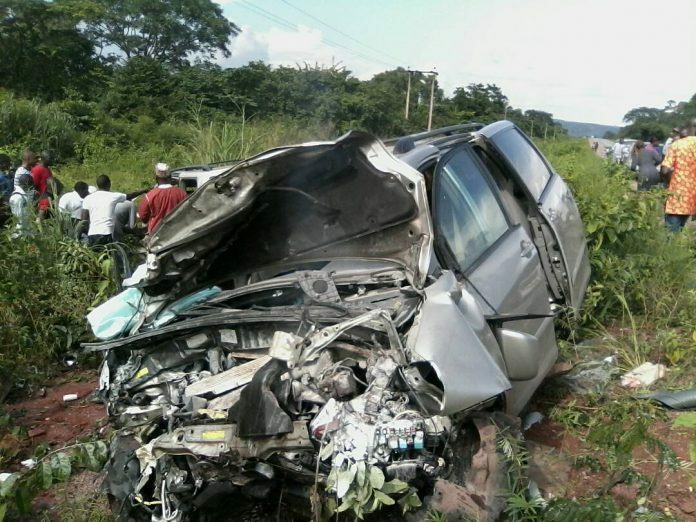 At least five persons were confirmed dead, on Tuesday, in different road crashes in Anambra State. The accident which occurred along Enugu/Onitsha expressway involved a Toyota pickup van with Reg. NSR 428 AU with eight passengers, killing three persons and injuring five persons. It was gathered that the accident occurred when the driver of the vehicle who was coming from Aguleri to Upper Iweka in Onitsha, lost control and somersaulted along the expressway at Vin filling station killing three persons instantly. An eyewitness said that police patrol team from Awada Police Station, who rushed to the scene, took the victims to Borommeo Hospital where the three persons were confirmed dead by the doctor on duty, while other five victims who sustained various degrees of injuries were responding to treatment. The corpses of the deceased were deposited at the Borommeo morgue for autopsy. Also, there was a multiple accident along Nibo road by Government Lodge, in Awka, involving a Mercedes tipper with Reg. 405 XV when the vehicle lost control and colluded with three tricycles (Keke NAPEP) and a Toyota Camry car killing one female passenger and four other sustained injuries. The police patrol team attached to Awka who visited the scene was said to have rushed the victims to Teaching Hospital, Amaku where the injured were responding to treatment while the corpse of the deceased was deposited to the hospital morgue. In another development, there was accident involving a caterpillar belonging to a construction company in the area without registration number that hit a motorcycle rider while avoiding a pothole at Aguleri where the rider sustained serious injure and later confirmed dead in a hospital. An eyewitness said that the policemen from Otuocha Police Station rushed the victim to Ideal hospital Ifitedunu where he was certified dead while receiving treatment, saying that the corpse was deposited at Hens mortuary. Police Public Relations Officer (PPRO) in the state, Mr. Haruna Mohammed, who confirmed the incidences, said that the truck driver and caterpillar driver were arrested while the obstruction caused by the accident was cleared. He said that the accidents were under investigation after which the suspect would be charged to court, saying that the corpses were deposited to morgues for autopsy. The PPRO however urged the members of the public to always drive with caution especially now that ember months are fast approaching in order to avoid accidents.